Now that Thanksgiving is over, it's time for Christmas decorating! This makes me extremely happy. 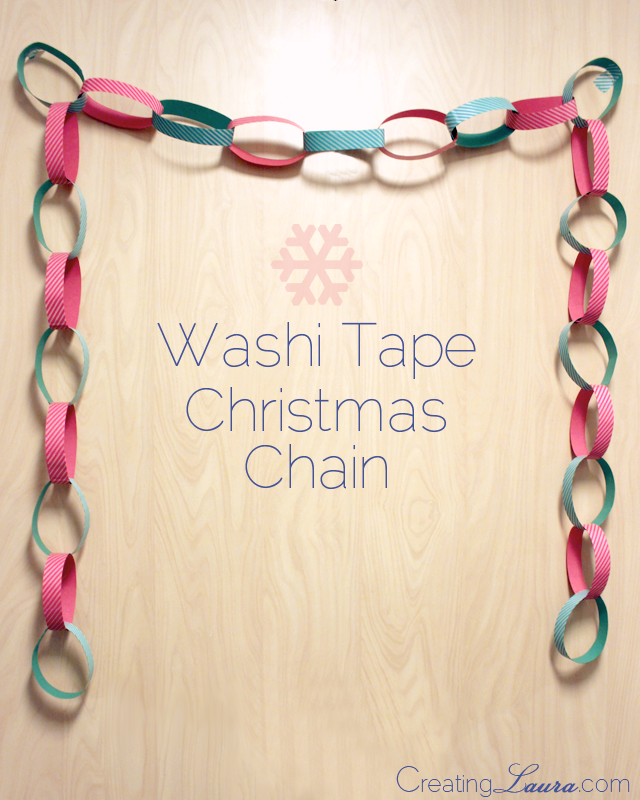 I was lying in bed the other morning thinking about those old-school Christmas chains I used to make out of construction paper as a kid, and it occurred to me that a little washi tape could totally make one of those chains feel all grown up. 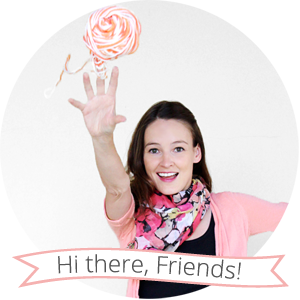 Washi tape can do that for just about anything, don't you think? When I put my idea into action, I also realized that the washi tape makes the chains even easier to make than the construction-paper-only chains from my childhood because you can use the edges of the tape as a guide for cutting straight lines. Another bonus is that this project only took about 15 minutes! 2. A roll of washi tape with red accents and a roll with green accents. I used striped tape because it reminds me of candy canes. 1. 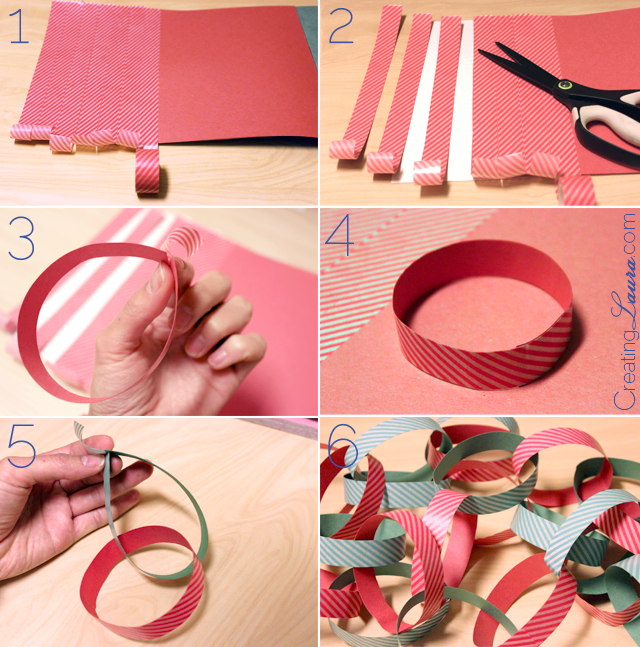 Place 13 strips of reddish washi tape across the width of a piece of red construction paper and 12 strips of greenish washi tape across the width of a piece of green construction paper. As you do this, leave an inch-long tail of washi tape hanging off of the edge of the construction paper. 2. Cut out the strips of washi taped construction paper, using the edges of the washi tape as a guide. You should now have a total of 25 red and green strips. 3. Turn your first strip into a loop and use the washi tape tail to secure it. 4. It will look extra-professional if you make the pattern on the washi tape tail match up with the pattern on the tape that you're taping over. See how the diagonal stripes all match up with each other in the 4th picture? 5. Now add the rest of the chain links one at a time by repeating steps 3 and 4 with each strip, making sure that you loop each new strip around the previous loop before you tape it closed. 6. Once you've added all 25 links to you're chain, hang it up, you're finished! 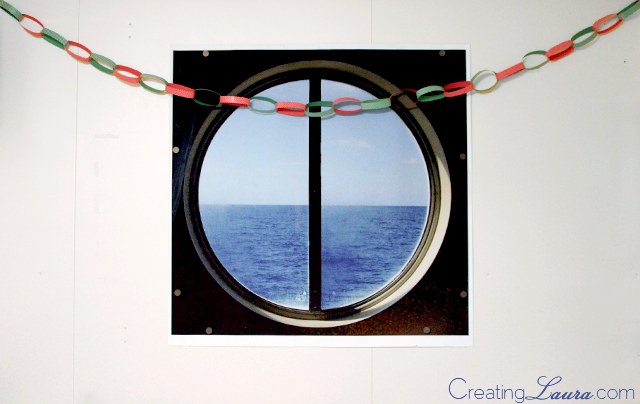 I hung my chain in our cabin, and I think it compliments our porthole picture very nicely. I'm looking forward to December 1st so I can start ripping off one of the loops every day until Christmas! Cute! My girls love garlands. That ocean view is so pretty! This is such a cute idea! I've been meaning to whip up some sort of garland for my house. I love how it looks over the porthole!